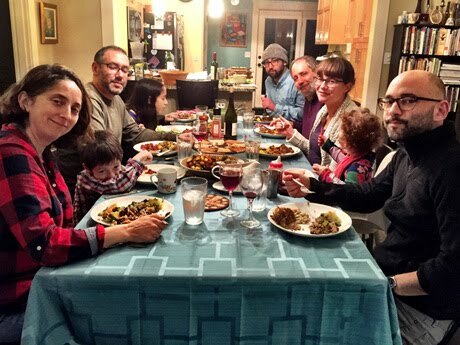 We had 10 people at the Thanksgiving table this year, including three children, and enough food for about 10 more, but I love Thanksgiving leftovers. 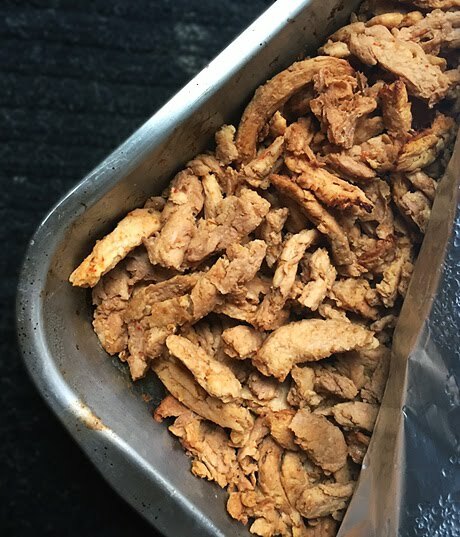 On Friday one of our sons came for dinner, and we had leftovers — after my husband and I had already had leftovers for breakfast and lunch. We had leftovers on Saturday and Sunday (breakfast and lunch) too, and I finally finished them off on Monday. Understand that I'm not complaining — as I said, I love leftovers — and am sad that they won't be available tomorrow. We had a lot of food, but I'm happy to say we didn't waste any. 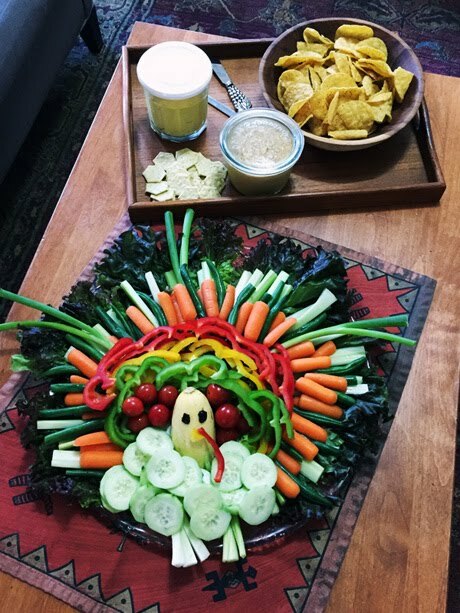 What you see above is our turkey. 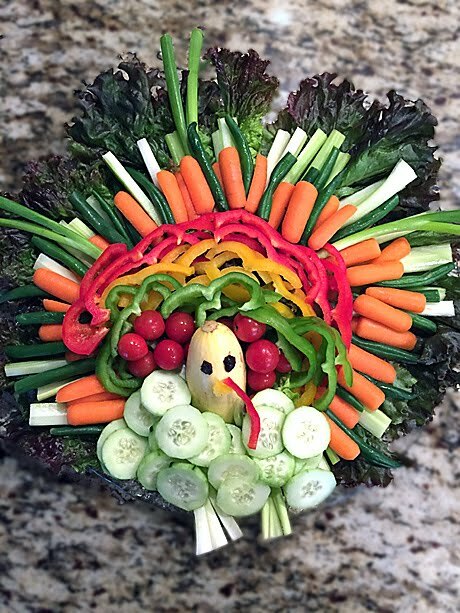 I found a photo of the veggie turkey online a few years ago and finally remembered to construct it this year. I wish I could remember exactly where I found it, but you can view the photo here. It served as one of the appetizers along with homemade hummus and smokey cheese dip. 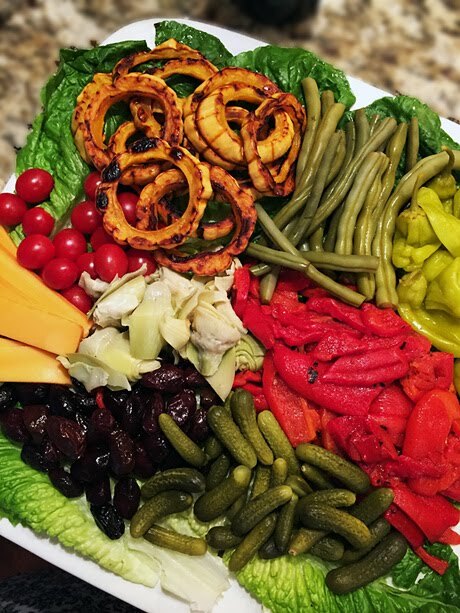 Our daughter-in-law brought a large plate of fabulous pickled vegetables as an appetizer as well. And a bowl of olive tapenade — my favorite. I love tapenade! 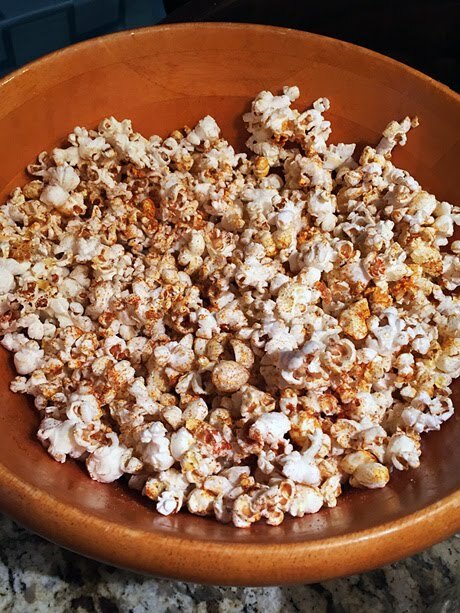 One son brought a bowl of chili lime popcorn as an appetizer, and it completely disappeared. Everyone came early so there was plenty of time to nosh before the main meal, and we made quite a dent in the offerings. From the main Thanksgiving feast, I can only show you some of the food because, as is often the case, I forgot to take photos of everything. There are no photos of the potato stuffing, a fabulous family favorite recipe that originally came from Russia with my great grandmother, and none of the 'main dish', the wild rice pilaf, or the miso gravy, or the savory white bean casserole. One of our sons made the stuffing and beans, and I made the pilaf and gravy. The pilaf was fluffy with wild rice and brown rice and stuffed with mushrooms, onions, garlic, toasted walnuts, air-fried brussels sprouts, peas, celery, soy curls, herbs and spices. I used parsley, sage and rosemary from the garden. The curls were marinated overnight in some of the gravy, and liberally seasoned with granulated onion and garlic as well as chili lime spice from Trader Joe's, then baked a bit before being added to the pilaf and baked in the oven. 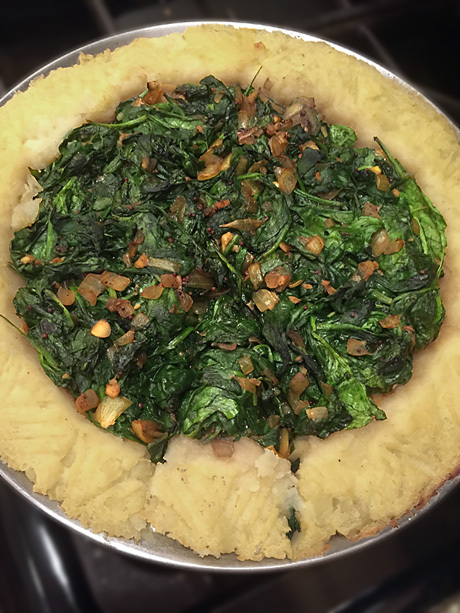 New to this year's Thanksgiving table was aloo palak pie in a mashed potato crust — a recipe from Pies and Tarts With Heart by Dynise Balcavage. (I reviewed the book in 2013 when it was first published; you can read the review here if you want to know more about Dynise's cookbook.) I loved, loved, loved the tart, and can't wait to make it again. 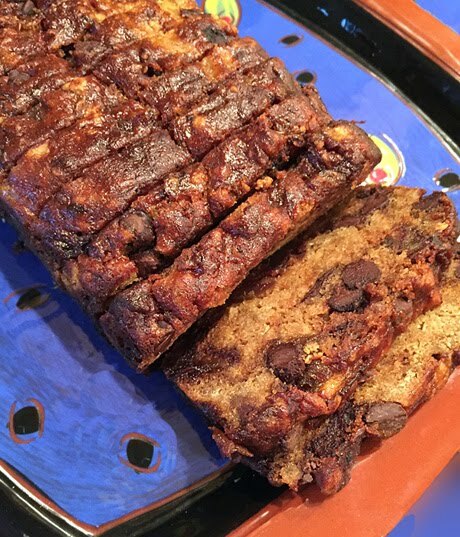 Because I had permission to publish the recipe when I wrote the review, I'm going to hope and assume I still have permission, and will include it at the end of the post. 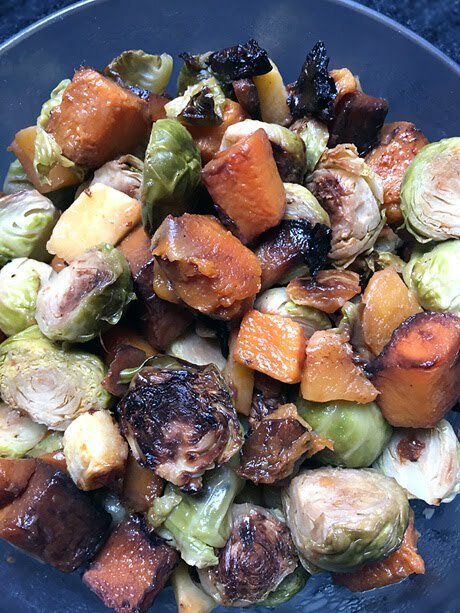 Roasted Brussels sprouts and butternut squash was my husband's beautiful and tasty contribution to the meal. We made the preparation of the dish much less time consuming by purchasing already cubed squash. Believe it or not, this was the first time we've bought pre-cut squash, but it certainly won't be the last. What a time-saver —tossed with a little oil and salt, and roasted to caramelized perfection. Since I failed to photograph the rest of the main course, let's just move on to dessert. 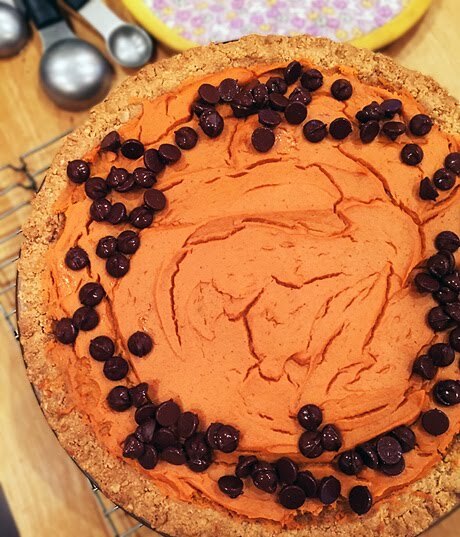 Of course there was pie — this year it was sweet potato pie. I used the same recipe I used last year for voluptuous pumpkin pie from Isa Chandra Moskowitz, except I used sweet potatoes, and only two (not four) teaspoons of oil. Because sweet potatoes are more dense than pumpkin or squash, it required a bit more soymilk. It's a great pie, and easy to make. I always garnish my pie with chocolate chips. 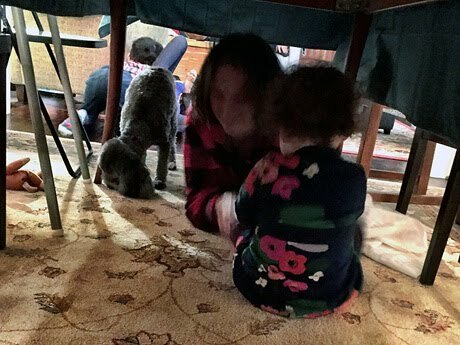 I hope you had a happy thanksgiving. Here are the recipes I promised for cranberry compote and spinach pie. 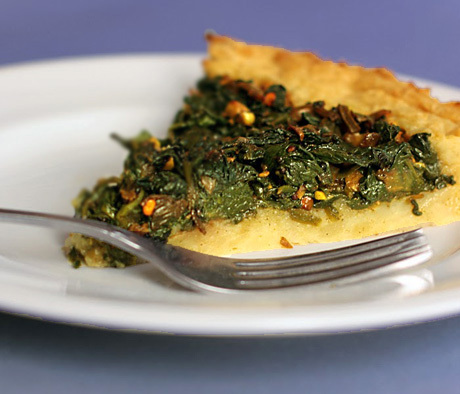 Just a note: when I made the pie I used three, five-ounce packages of fresh baby spinach for the pie filling. Add one-fourth of the spinach, let it wilt, stir, and repeat until all of the spinach is in the pan. Cook for about 10 minutes. Spread into the crust. 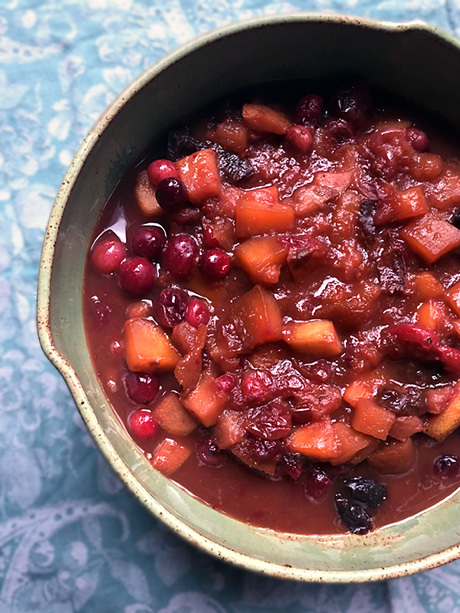 Adapted from Autumn Fruit Crock in Fresh From the Vegan Slow Cooker, by Robin Robertson, and memories of my mother's and grandmother's kitchens. 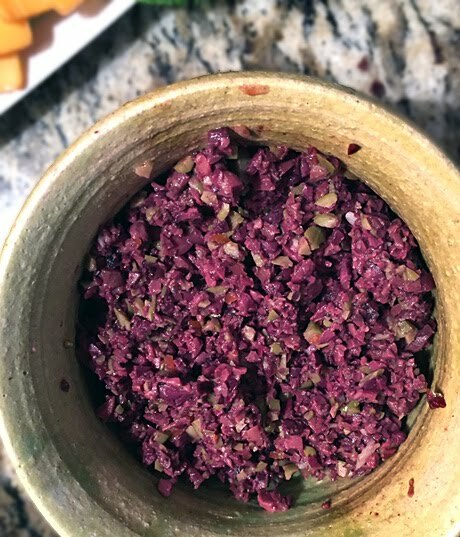 I think of the recipe as a 'guideline' rather than a 'recipe' because although this is close to what I did — I used two pears and one apple this time —you can do pretty much what you want, and adjust it to your preferences. I believe my mother always added pineapple chunks to hers. I like my cranberries tangy, but feel free to make them as sweet as you wish. This is a great dish to serve anytime, any holiday — all fall and winter. 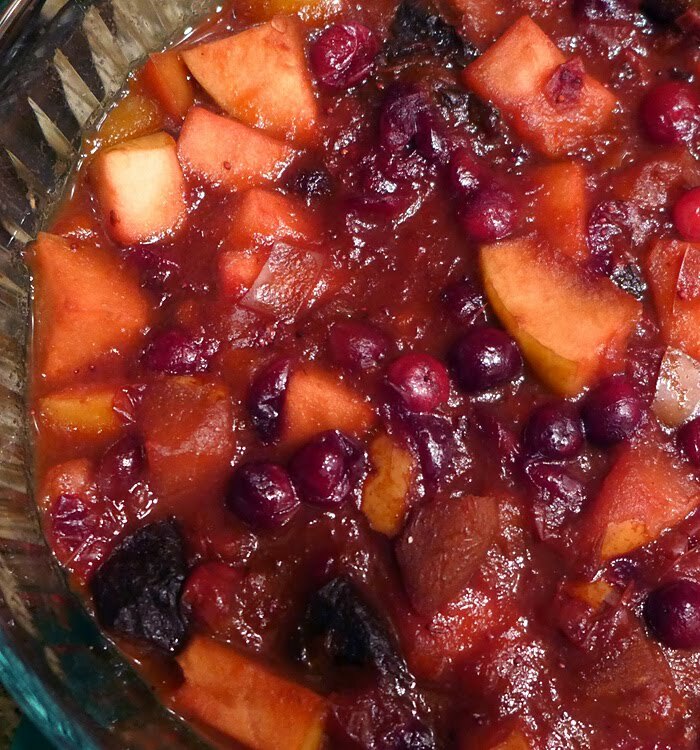 You can change up the type and quantity of the fruit except maybe for the cranberries, though I recommend keeping the mango as it adds natural sweetness, and goes so well with the cranberries. Leftovers are great for breakfast with yogurt or oatmeal. Dice all the fruit (except cranberries and raisins, if using) to approximate size of cranberries. I didn't peel my fruit. Stir in the vanilla and taste for sweetness. My compote turned out nice and thick, but if yours doesn't, cook a short while longer without the lid. I'm going to start with a gargantuan salad, because I just had it yesterday, and haven't yet forgotten anything about it. It was as big as it looks. We had gone out to lunch with a bunch of vegan friends, and I wasn't feeling very hungry, so I ordered a salad. We were lunching at Next Level Burger, a very casual, all-vegan, organic burger joint inside of Whole Foods. I guess I thought since the emphasis was on burgers, the salad wouldn't be a BIG deal. I must not have been paying attention. I ate about 1/4 of it, and we had most of the rest with dinner. I also ordered a delicious child-size vanilla shake. Everyone in our group seemed pleased with their burger choices, and I have to give a special shout-out to the wonderful, very knowledgeable, staff. As for gluten-free choices, in case you were wondering, almost everything on the menu is gluten-free and you can request a gluten free bun. Plenty of choices for everyone. Even the shakes can be made with either soy or coconut soft serve. Here is a nacho bowl with homemade cheese sauce. Sometimes I'm just too lazy to look up a recipe (like, for cheese sauce) so I just throw things into the blender that I think will taste good, and it usually works. 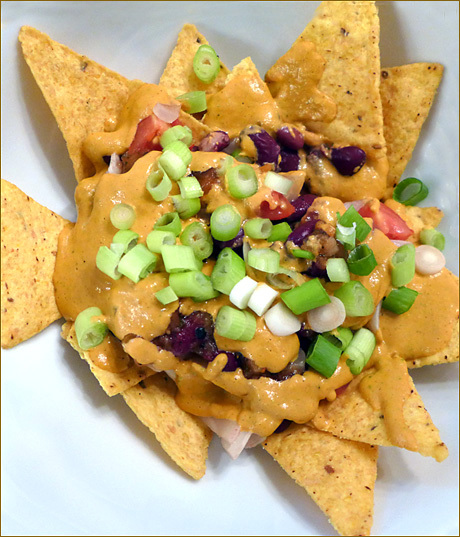 It worked this time, topped with green onions, and served over kidney beans, tomatoes and chips. I love tahini sauce — I've been making versions of tahini sauce for more than 30 years. Sometimes I add lemon juice, sometimes miso, sometimes umeboshi paste, etc. Lately my husband has started making it — a lot. 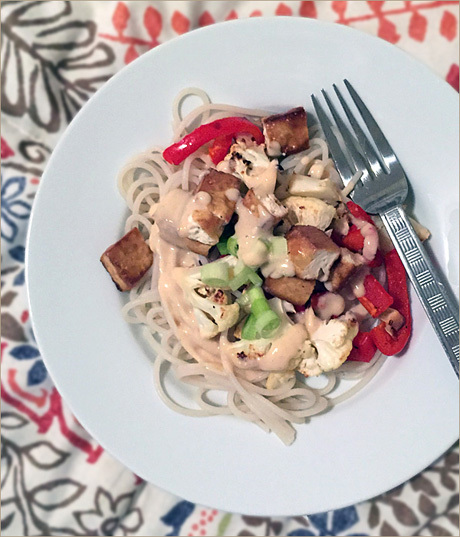 Here's a plate of noodles with air-fried tofu, roasted cauliflower, red peppers and tahini sauce. Tahini sauce. 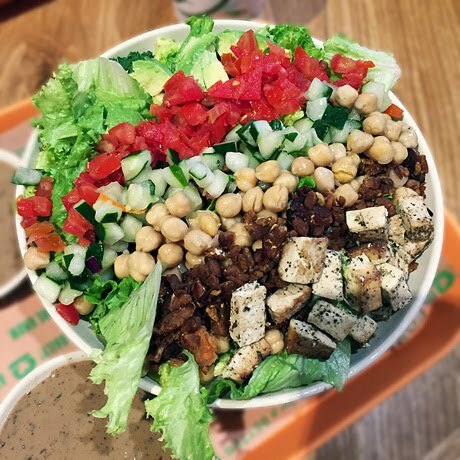 Did I mention the tahini sauce? Just kidding, Ken. You are getting seriously good at making tahini sauce. We do love our noodle bowls around here, and I have to say having the air fryer has upped the stakes on the deliciousness of the tofu. 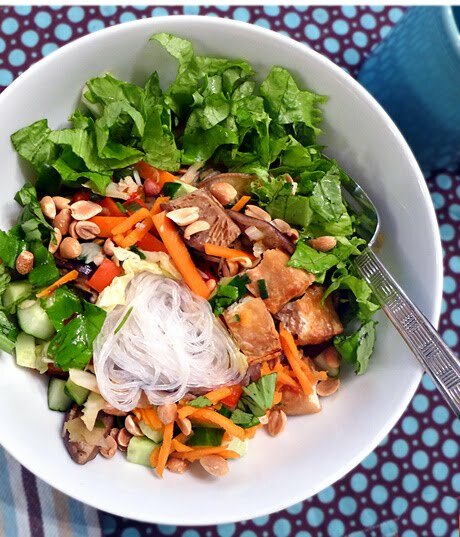 It looks like the bowl contains tofu, shiitake mushrooms, cucumbers, scallions, carrots, peanuts and romaine — a Vietnamese bun salad — probably a version of this one. The last one is a puzzle. It's a scallion pancake, obviously, and I vaguely remember trying to make a gluten-free version of this beloved favorite. I learned to make scallion pancakes long ago in a cooking class taught by a Chinese chef, and the pancakes were perfection. I sort of remember craving scallion pancakes, and trying to recreate them with gluten-free flour. I looked through the note pad where I scribble my recipe experiments, and I found one for scallion pancakes but there's no mention of whether it worked or not. Was it gummy? floury? weird? I don't remember. It looks good, though, doesn't it? 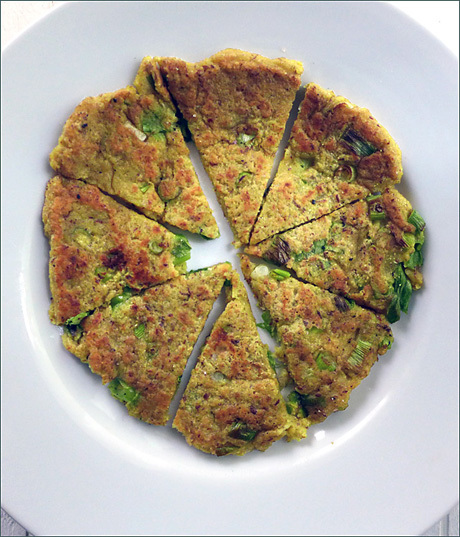 If you feel like making traditional scallion pancakes, you can find the recipe here.